As much as I love a cozy sweater when the weather gets cool I often opt for a cardigan instead…Mainly because I find that sweaters tend to be bulky and make me look lumpy. This basically puts a damper on my cold weather wardrobe as I look enviously at the girls sporting the pretty and oh-so-soft cashmere V-necks. So this year I made a vow to find the perfect sweater (for me) and while I was at it I decided why not come up with a list of this season’s best sweaters for everyone? So here it is ladies my Fall/Winter 2011 Everyone Deserves to Feel and Look Great in a Sweater List…sorry for the long title! This cashmere sweater tunic is the perfect combination of comfort and style. The soft cashmere will keep you warm while you stay on trend all season by pairing it with sheer polka dot tights or even a pair of dark wash skinny jeans and booties. 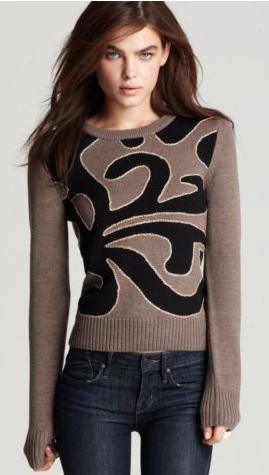 I have decided that this Marc by Marc Jacobs is my perfect Fall/Winter 2011 sweater, its fitted style will help me to avoid looking much bigger than I am (no more lumpy look). Plus the black abstract design with metallic gold piping will give me the option to dress it up with a flared skirt and tights or down with my favorite pair of jeans… I’ve seriously fallen in love. If you’re looking for a sweater that will brighten up your work apparel (color pop is still on trend for fall) then you should invest in one of these crew neck sweaters from J. Crew. They not only come in yummy colors like dark poppy and Georgia peach, but the chunky horn shoulder buttons give this everyday basic a more signature feel. Okay I know I said I was in love with the Marc sweater only one sweater ago, but how absolutely gorgeous are these nearly neon diamond, daisy, and chevron patterns? I could come up with suggestions on how to wear this sweater, but I think the stylists at Anthropologie were spot on with these white wide leg pants… Of course I would say you could wear it with virtually anything you’d like and it would still be amazing. Tory Burch did an excellent job at taking the usually fitted, simple, solid-colored turtle neck and turning it into a cozy, chunky knit that you’ll want to wear all winter long. You’ll be even happier to hear that it is also extremely lightweight so you won’t have to worry about getting too warm…and again with the white trouser!